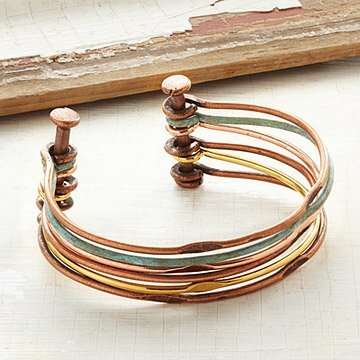 Inspired by Latin American handicraft, this rustic cuff features six hand-hammered strands of copper. Argentinian jewelry designer Fernanda Sibilia brings the flair of traditional Latin American handicraft to her rustic, hand-hammered metal pieces. In this warm, mixed-metal cuff, she deftly bows brass threads and electroplates select pieces with lustrous gold and warm copper. She then lets the magic of oxidation give select strands a one-of-a-kind patina that varies in hue from dark brown to creamy sea green. Six unique yet harmonious threads are hammered into an open cuff shape and looped around copper bolts that serve to secure and visually anchor the finished piece. Handcrafted in Buenos Aires, Argentina. Make it a set! Pair this cuff with the Mixed Metals Bar Necklace and Ring. It's a unique piece and quite beautiful. I love it bc it is adjustable for a smaller wrist. This is a truly beautiful and unique bracelet. I have been keeping a watch for a bracelet that would complement another unique pendant and earring set, also in mixed metals. The colors are spot on and fits my small wrist perfectly without adjusting. My wife loved it! I won Christmas this year. She wears it both cas and formal.... always gets comments. Gave this as a gift to my Mum and she absolutely loved it... the mix of metals is very unique and also allows it to be dressed up (for instance for a nice brunch out for Mother's day) or down. She was delighted. Definitely recommended. This looks great but is really for a petite person. Can be dressed up or dressed down. I like understated, unique jewelry and this was perfect. Certainly not something everyone has. I bought both the necklace and the bracelet and have received compliments every time I have worn them (together or separate). The bracelet fits perfectly, but if my wrists were any bigger it wouldn't be comfortable. Goes best with neutrals or natural tones that make all of the different colors of plating on the metal pop. Definitely worth the money. Beautiful bracelet. Unique design. But the turquoise colored ring, that makes the bracelet stand out, chipped very easily. The bracelet was as unique as I expected. It's wearable with any outfit. I was glad that I could tighten it a little since my wrists are small. Although it discolors my skin sometimes, it's distinctive and good looking. Ad cautioned not to get wet, maybe I have without knowing. Maybe a little pricey, but I'm happy I bought it.